Louis William Wain was born on August 5, 1860 in Clerkenwell in London. His father was a textile trader and embroiderer, his mother was French. He was the first of six children, and the only male child. None of his five sisters ever married. At the age of thirty, his youngest sister was certified as insane, and admitted to an asylum. The remaining sisters lived with their mother for the duration of their lifetimes, as did Louis for the majority of his life. 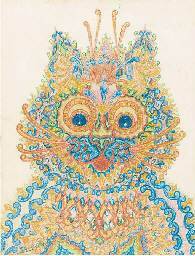 Pictured: The Contented Cat signed ‘Louis Wain.’ – bodycolour 11 x 9¼ in.. Sold for £5,250 ($8,022) against an estimate of £700 – £900 ($1,070 – $1,375) at Christies, London, July 2010. Wain was born with a cleft lip and the doctor gave his parents the orders that he should not be sent to school or taught until he was ten years old. As a youth, he was often truant from school, and spent much of his childhood wandering around London. Following this period, Louis studied at the West London School of Art and eventually became a teacher there for a short period. At the age of 20, Wain was left to support his mother and sisters after his father’s death. Pictured: A Louis Wain Pottery Model Of ‘The Laughing Cat’, Manufactured By Royal Staffordshire, Early 20th Century, modelled seated wearing a bow tie printed and painted marks 7½ in. (19.1 cm.) high. Sold for £563 ($1,018) at Christies, London, September 2008. Wain soon quit his teaching position to become a freelance artist, and in this role he achieved substantial success. He specialized in drawing animals and country scenes, and worked for several journals including the Illustrated Sporting and Dramatic News, where he stayed for four years, and the Illustrated London News, beginning in 1886. Through the 1880s, Wain’s work included detailed illustrations of English country houses and estates, along with livestock he was commissioned to draw at agricultural shows. His work at this time includes a wide variety of animals, and he maintained his ability to draw creatures of all kinds throughout his lifetime. At one point, he hoped to make a living by drawing dog portraits. 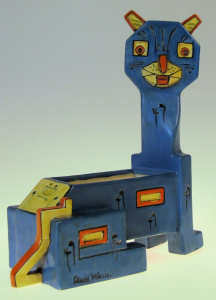 Pictured: An early 20th Century Amphora (Austrian) pottery figure of a cat in the “Cubist” manner designed by Louis Wain, the octagonal head and angular body decorated in yellow, orange and black on a turquoise ground, 10.5ins high x 9.5ins overall (green printed mark to base with registration No. 637132 and signed in black). 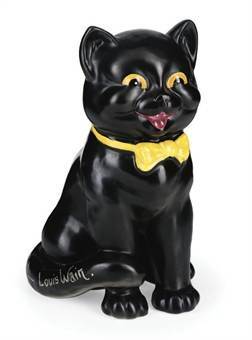 Sold for £8200 at the Canterbury Auction Galleries, June 2008 a then record for a Louis Wain ceramic cat figure. At the age of 23, Wain married his sisters’ governess, Emily Richardson, who was ten years his senior (which was considered quite scandalous at the time), and moved with her to Hampstead in north London. Emily soon began to suffer from cancer, and died only three years after their marriage. It was during this period that Wain discovered the subject that would define his career. During her illness, Emily was comforted by their pet cat Peter, and Wain taught him tricks such as wearing spectacles and pretending to read in order to amuse his wife. He began to draw extensive sketches of the large black and white cat. He later wrote of Peter, “To him properly belongs the foundation of my career, the developments of my initial efforts, and the establishing of my work.” Peter can be recognized in many of Wain’s early published works. In 1886, Wain’s first drawing of anthropomorph ised cats was published in the Christmas issue of the Illustrated London News, titled A Kittens’ Christmas Party. 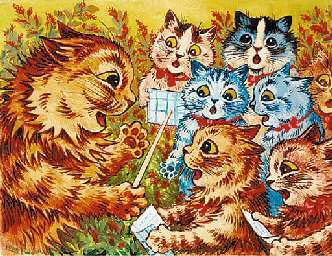 The illustration depicted 150 cats, many of which resemble Peter, sending invitations, holding a ball, playing games, and making speeches over eleven panels. Still, the cats remain on all fours, unclothed, and without the variety of human-like expression that would characterize Wain’s work. Under the pseudonym George Henri Thompson, he illustrated numerous books for children by Clifton Bingham published by Ernest Nister. In subsequent years, Wain’s cats began to walk upright, smile broadly and use other exaggerated facial expressions, and wear sophisticated contemporary clothing. Wain’s illustrations showed cats playing musical instruments, serving tea, playing cards, fishing, smoking, and enjoying a night at the opera. Such anthropomorphic portrayals of animals were very popular in Victorian England, and were often found in prints, on greeting cards and in satirical illustrations such as those of John Tenniel. Pictured: The choristers signed ‘Louis Wain’ (lower left), watercolour and bodycolour, 7 x 9in. (17.8 x 22.8cm.). Sold for £7,050 ($9,976), Christies, London, December 2001. Wain was a prolific artist over the next thirty years, sometimes producing as many as several hundred drawings a year. He illustrated about one hundred children’s books, and his work appeared in papers, journals, and magazines, including the Louis Wain Annual, which ran from 1901 to 1915. His work was also regularly reproduced on picture postcards, and these are highly sought after by collectors today. In 1898 and 1911 he was chairman of the National Cat Club. Wain was involved with several animal charities, including the Governing Council of Our Dumb Friends League, the Society for the Protection of Cats, and the Anti-Vivisection Society. He was also active in the National Cat Club, acting as President and Chairman of the committee at times. He felt that he helped “to wipe out the contempt in which the cat has been held” in England. 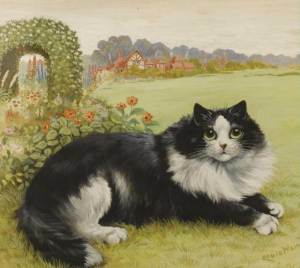 Pictured: The Cat in his Garden, 287 by 320mm., fine watercolour and gouache drawing, signed in lower right corner “Louis Wain”, mounted, framed and glazed. Sold for £15,000 at Sothebys, London, Dec 2008. Despite his popularity, Wain suffered financial difficulty throughout his life. He remained responsible for supporting his mother and sisters, and had little business sense. Wain was modest and easily exploited, ill-equipped for bargaining in the world of publishing. He often sold his drawings outright, retaining no rights over their reproduction. He was easily misled, and occasionally found himself duped by the promise of a new invention or other money-making scheme. He travelled to New York in 1907, where he drew some comic strips, such as Cats About Town and Grimalkin, for Hearst newspapers. His work was widely admired, although his critical attitude toward the city made him the subject of sniping in the press. He returned home with even less money than before due to imprudent investment in a new type of oil lamp. From this point, Wain’s popularity began to decline. He returned from New York broke, and his mother had died of Spanish influenza while he was abroad. His mental instability also began around this time, and increased gradually over the years. He had always been considered quite charming but odd, and often had difficulty in distinguishing between fact and fantasy. Others frequently found him incomprehensible, due to his way of speaking tangentially. His behavior and personality changed, and he began to suffer from delusions, with the onset of schizophrenia. Whereas he had been a mild-mannered and trusting man, he became hostile and suspicious, particularly towards his sisters. He claimed that the flickering of the cinema screen had robbed the electricity from their brains. He began wandering the streets at night, rearranging furniture within the house, and spent long periods locked in his room writing incoherently. 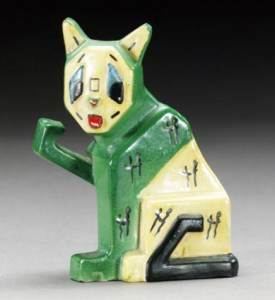 Pictured: An English Pottery `Louis Wain’ Pottery Model Of A Cat, Designed 1914, modelled seated with one paw raised, painted, printed and impressed marks including: `Louis Wain’ and Reg. No. 637134 Sold for £4,560 at Sothebys, London, June 2005. Some speculate that the onset of Wain’s schizophrenia was precipitated by toxoplasmosis, a parasitic infection that can be contracted from cats. The theory that toxoplasmosis can trigger schizophrenia is the subject of ongoing research, though the origins of the theory can be traced back as early as 1953. When his sisters could no longer cope with his erratic and occasionally violent behavior, he was finally committed in 1924 to a pauper ward of Springfield Mental Hospital in Tooting. A year later, he was discovered there and his circumstances were widely publicized, leading to appeals from such figures as H. G. Wells and the personal intervention of the Prime Minister. Wain was transferred to the Bethlem Royal Hospital in Southwark, and again in 1930 to Napsbury Hospital near St Albans in Hertfordshire, north of London. This hospital was relatively pleasant, with a garden and colony of cats, and he spent his final 15 years there in peace. While he became increasingly deluded, his erratic mood swings subsided, and he continued drawing for pleasure. His work from this period is marked by bright colors, flowers, and intricate and abstract patterns, though his primary subject remained the same. Dr. Michael Fitzgerald disputes the claim of schizophrenia, indicating Wain more than likely had Asperger syndrome (AS). Of particular note, Fitzgerald indicates that while Wain’s art takes on a more abstract nature as he grew older, his technique and skill as a painter did not diminish as one would expect from a schizophrenic. Moreover, elements of visual agnosia are demonstrated in his painting, a key element in some cases of AS. If Wain had visual agnosia, it may have manifested itself merely as an extreme attention to detail. 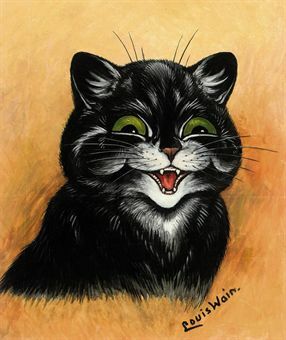 Pictured: A wide-eyed cat signed ‘Louis Wain’ 8¾ x 6 5/8in. (22.2 x 16.8cm.). Sold for £5,640 ($7,981) at Christies, London, Dec 2001. His work is now highly collectible but care is needed as forgeries are common. Background information text: Copyright (C) 2000,2001,2002 Free Software Foundation, Inc. 51 Franklin St, Fifth Floor, Boston, MA 02110-1301 USA Everyone is permitted to copy and distribute verbatim copies of this license document, but changing it is not allowed.